WBU is a common expression in text messaging, but it's meaning might be difficult to decipher. HBU, which stands for How About You? can be used interchangeably with WBU. WBU or HBU are used the same way people use the phrases in spoken conversations. This is internet shorthand for asking, "How about you, do you agree?" or "What about you, do you have a suggestion?" It can be used to learn more about someone. People often share something about themselves and then pose the question, hoping to learn something similar about the hobbies or personality of the person with whom they are conversing. People use it to ask for ideas or input. In addition, it is often used in small talk to politely keep a conversation going. Friend 1: I'm hungry for some Vietnamese food. WBU? Friend 2: SGTM! 6 p.m. at the Pho House? 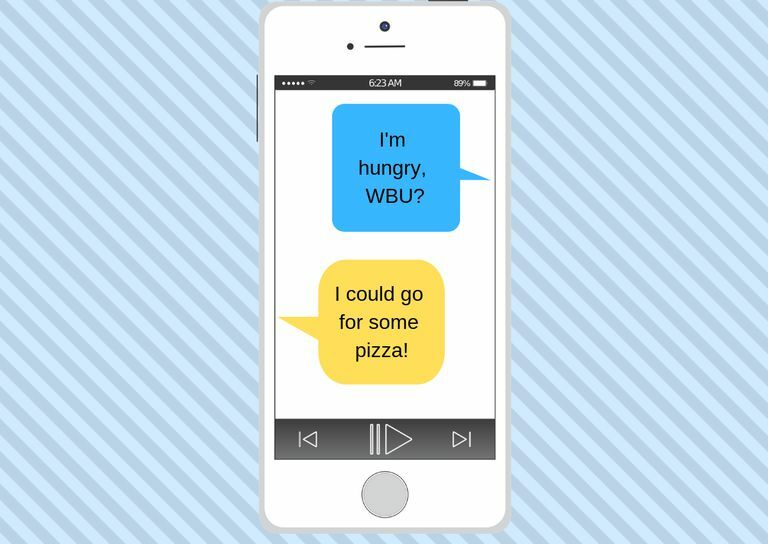 In this example, the first friend uses WBU to ask if the second friend would like to meet up for food. Friend 1: do u really wanna go to Karen's apartment party 2night? Friend 2: sure, it'll be fun. wbu? don't you want to go? In this example, the second friend uses WBU to clarify whether or not the first friend wants to go to a party. Friend 1: Pung, let's not meet with Colin on this tonight. I need to go think about this first. Friend 2: OK, that's probably best you cool off before we bring this up. I can do Friday, WBU? Friend 1: Friday after lunch is good. I'll write down my thoughts tonight so I do a good job explaining the issues to him. In this example, the second friend uses WBU to find out if Friday is a good time for the first friend to meet up. Friend 1: omg, I'm so hungry. Friend 2: Mhm! I could go for a plate of sushi right now, HBU? Friend 1: sushi sounds good! Meet me in front of the library in 10 minutes! In this example, the second friend uses HBU to ask if the first friend would like to go have some sushi. Friend 1: I love to hike, swim, and dabble in watercolor painting. HBU? Friend 2: Love to swim. Big fan of roller derby, too. In this example, the first friend is sharing personal details and uses HBU to show interest in the second friend's hobbies. The WBU and HBU expressions, like many other online expressions and web lingo, are part of online conversation culture and build cultural identity through language and playful conversation. About 90 percent of the time, these expressions are typed in all lowercase letters. On selective occasions, use them in all capitals to express enthusiasm. Just remember not to type entire sentences in all caps, lest you be considered rude. As you browse social media sites or read messages from friends, you might encounter other expressions that are not clear at first glance. For instance, a long post on Reddit might include a separate, smaller paragraph with the heading 'TLDR'. While this acronym can be helpful when you're short on time or attention, others are a bit more harsh, such as 'RTFM' when someone asks a question with a seemingly obvious answer, or 'EPEEN' to mock someone who seems a bit egotistical. Learning these common expressions can help you navigate the net without looking like a 'Noob'.